Most people may not realize it today, but Buick has been one of the most innovative automotive companies since it started 110 years ago, with a host of industry firsts to its credit. Celebrate 110 years of manufacturing with us as we look back at Buick's history in steel and chrome. Buick is the oldest still-active automaker in America, originating as Buick Auto-Vim and Power Company in 1899 and then incorporated into the Buick Motor Company in 1903 by David Dunbar Buick in Detroit, Michigan. Later that year, Buick sold his stock in the company to James H. Whiting to be managed by William C. Durant and facilities were moved to Flint, Michigan. After a couple of prototype builds, a third prototype built for an endurance run convinced Whiting that they might be on to something and he gave Durant the go-ahead to begin production. 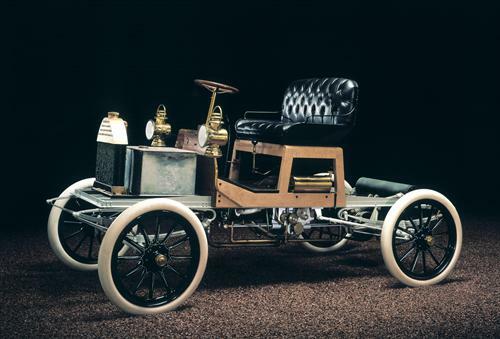 The 1904 Model B (pictured) was the result, with 37 of them being built. None of those originals survive today, but two replicas have been made, one owned by the Buick Gallery & Research Center in Flint and the other by a private enthusiast in California who built it for Buick's 100th anniversary. The Model B measured just 83 inches in its wheelbase - compare that to today's shortest-wheelbase Buick, the 2013 Encore at 100.6 inches. The basic design of the 1904's powertrain continued through 1909, being a well-balanced flat twin engine positioned that was ahead of its time. It didn't take long for Durant to start thinking big. As Buick quickly became the nation's largest carmaker and the then-innovative valve-in-head (aka overhead valve or OHV) design of their 1909 engine for the Model F began selling as fast as the company could make them, Dunbar began expanding. His acquisitions of other manufacturers in automotive and transportation soon became the General Motors Corporation. It was then that Buick became the premium brand as we know it today, competing against the nation's top premium maker, Cadillac - which, of course, GM now also owns. From those first 37 cars, Buick has continuously manufactured vehicles into the present. At the end of 2012, the company had built more than 43 million vehicles in its lifetime and is still going strong. The company has also been heavily involved in motorsports, with its first performance racer debuting in 1908. The company has provided pace cars for six Indianapolis 500 races and won the NASCAR Manufacturer Championships two years in a row (1981-82). It also won the first ever race held at the Indianapolis Motor Speedway and introduced the industry's first closed-body car in 1911, four years before Henry Ford and his Model T.
In 1931, Buick introduced the Straight-8 engine, one of the most innovative engines ever developed and one that changed automotive forever. Another innovation introduced that year by Buick was the synchromesh transmission, which allowed gear shifting without a double-clutch and revolutionized driving forever. In 1939, Buick introduced turn signals to the vehicle - something that is now standard on every car made and universally ignored by drivers. That same year, steering-mounted shifting was also made standard in Buicks. In 1948, the Dynaflow automatic transmission was introduced and again revolutionized driving forever. Buick has introduced many great concepts and ideas in its history, but probably the most-loved and famous concept vehicle ever produced was Harley J. Earl's innovative 1938 Buick Y-Job. Considered the first true concept car, the Y-Job was Earl's official "company car" until 1951 when the LeSabre concept was introduced. The Y-Job is credited with a host of styling innovations that eventually became staples of General Motors, including wraparound bumpers and fenders, power-operated headlamps, flush door handles, and a distinct lack of running boards. It also debuted Buick's still-distinctive waterfall grille. Although U.S. sales of Buick peaked in 1984 and have been relatively abysmal since, the company has a strong international following and is the best-selling brand in China. General Motors has kept the division alive, however, as a core brand for the company with good profitability. Overseas, several GM brands were consolidated or dumped with models or facilities moved into Buick's name. The Opel Insignia, for example, became the Buick Regal, a car that is surprisingly fun to drive. Through its 110 years of history, Buick has managed to create some of the most compelling vehicles in automotive history, changing the way the industry and drivers at large view their automobiles. Today, the company is competing in the entry-level luxury segment alongside stiff competitive rivals like Lexus and Acura. Although domestically it's only seeing marginal success, internationally, it is doing very well and the brand is one of GM's fastest-growing in recent years. With a history as long and storied as this, it's no wonder the company can keep looking forward to more. Once again, my hat's off to Harley. That '38 is one beautiful automobile. Definitely one of the greatest vehicles ever designed. The 1951 LeSabre design was beautiful as well, sort of Earl's follow-up to the Y-Job.